Swimming pool drains and child water safety. Adult and child swimming pool safety rules and regulations of public swimming pools could save your life. Pool drains have accounted for hundreds of death in the last 30 years. They can come loose or not be there at all. Having a proper drain and an understanding of what can happen can save a child's life. They are for filtration and pool drainage to help drain the pool. Children like to swim to the deepest part of the pool and see how fast they can come back up. Most of the time children, or adults for that matter, have no idea the power that is created by pool's filtration system. This suction is so powerful it can actually hold a grown adult down. Imagine what it can do to a child, resulting in injury or drowning. There have been cases where children have been disemboweled after sitting on a pool drain. Don't allow you child become another drowning statistic. I understand that while checking drains is not something that many people think about, it's crucial that all pool and spa drain covers are compliant with the Virginia Graeme Baker Pool & Spa Safety Act (VGB Act), whether they're home or commercial pools and spas. At this time, no public pool or spa should be open if the facility is not compliant with the VGB Act. PUBLIC LAW 110–140—DEC. 19, 2007 TITLE XIV—POOL AND SPA SAFETY SEC. 1401. SHORT TITLE. This title may be cited as the ‘‘Virginia Graeme Baker Pool and Spa Safety Act’’. SEC. 1402. Of injury-related deaths, drowning is the second leading cause of death in children aged 1 to 14 in the United States. In 2004, 761 children aged 14 and under died as a result of unintentional drowning. Adult supervision at all aquatic venues is a critical safety factor in preventing children from drowning. Research studies show that the installation and proper use of barriers or fencing, as well as additional layers of protection, could substantially reduce the number of childhood residential swimming pool drownings and near drownings. The Virginia Graeme Baker Pool and Spa Safety Act (along with the death of Abigail Taylor) was passed by Congress in 2007 and requires commercial pools to replace their old pool drains with a safety pool drain. I am proud to say that the YMCA in Albany, OR was, to the best of my knowledge, one of the first commercial pools in the state of Oregon that installed a new pool drain. I was the pool operator starting in 2008 and pushed to get a new anti-vortex drain installed. This law is for the improvement and inspections of commercial pools and Hot Tubs, however, enforcing the law is a bit more difficult. Many pools are not inspected and the parents take for granted that the pools in which they and their children swim are safe. This doesn't include swimming pool deck drains sometimes called swimming pool overflow drain. To make sure that the pool in which you swim is safe, ask the pool operator or manager for the documentation of their compliance to the Virginia Graeme Baker Act. If they can’t, ask why. If they don’t have a good solid answer, simply walk away. Refuse to swim in that pool and don’t allow your children near the pool. If you do allow them to swim, tell them in no uncertain terms to stay away from the bottom swimming pool drain. No T.V. for a year, grounding for life, and no video games until they're 90 years old. Whatever it takes. It’s not a game. It could save your child’s life. To the best of my knowledge, all commercial and public pools should have been compliant by December 2008. Suction entrapment is when something or someone becomes stuck to a drain or suction fitting in a pool or spa. This is a particularly serious hazard for children who are not strong enough and too small to get away. 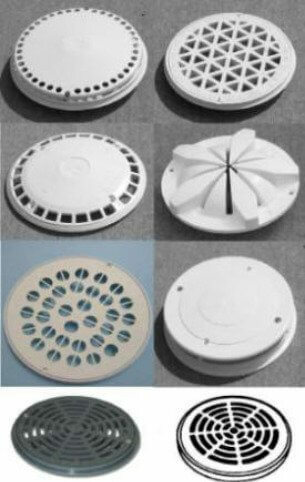 There are mainly 5 kinds of suction entrapment. It is what it says it is, simply being trapped to a swimming pool drain cover by the suction it creates. With a little research and common sense, we can all make a difference. The following is a list of things you can do to make sure your pool is safe for everyone. Make sure that the swimming pool drain is the correct size and is compliant with the above law. It should be in good condition without any missing or loose screws, and the filtration system should be in proper working order. 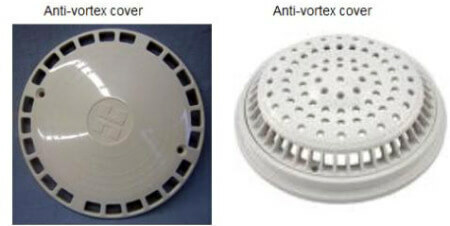 Be sure the Hot Tub or swimming pool drain cover is “anti -vortex”. This means the cover is designed to distribute the water from the sides as well as the top. Some may even be domed shaped to make it harder to form a tight seal around a child’s rear-end, back, or stomach. This allows the suction's power to be reduced at one end and they are so spread apart that it’s impossible to cover all of them at the same time. Stay clear of the channel drains and floor drain grates. Have multiple drains with the “anti-vortex” pool cover. There are some swimming pool drains that simply cover the drain. This is mainly for your pool cleaner to not get stuck on the bottom pool drain. Injuries and deaths from swimming pool drains have been going on for years, but just recently has anything been done about it. I say good. It's about time we're all on the same page concerning swimming safety. Be the example and get it done today.